Michigan steelhead, salmon, trout and bass fishing. Arkansas duck hunitng trips. 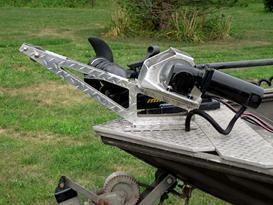 Are you looking for a dependable, reliable and durable system for your boat? 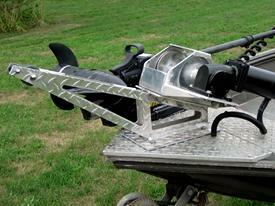 Visit our anchor systems page. "Experience Michigan with an Experienced Guide"
Head Hunter Guide Service was founded by Jason and Jean Stephens with the dream of sharing the outdoor adventures we enjoy so much with others. If you like exploring some of the most beautiful rivers in Michigan while experiencing the finest fishing in West Michigan, we're the guide service you've been looking for. We specialize in fishing trips on the Kalamazoo, Grand, Manistee and Muskegon Rivers, using an 18 foot jet sled to easily gain access to some of the best spots on those rivers. You'll learn the most progressive techniques including drift fishing, fly fishing, bait casting and bottom-bouncing, depending on conditions and the time of year. 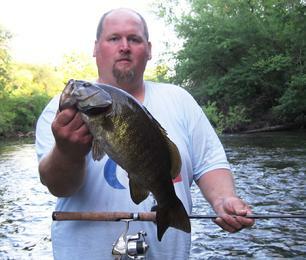 Smallmouth fishing on the Kalamazoo and Grand Rivers excels in the summer months. 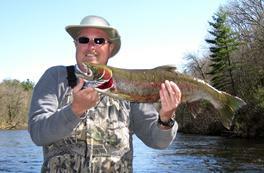 Steelhead can be found in all of the rivers in the spring and the fall is famous in Michigan as salmon season. Prices start at $175 per person per day (2 person minimum or $350 per day) and may include a shore lunch depending on the trip length. Smallmouth bass fishing, Kalamazoo fishing guides, Kalamazoo River Salmon and Steelhead Fishing, Salmon Fishing Charter, South Haven Charter Fishing, Southwest Michigan fishing guides, Michigan Guide service, Goose hunting guides, South Haven Perch Fishing, Lake Michigan Perch Fishing, South Haven Perch and Salmon Charter, Perch and Salmon Charters on Lake Michigan out of the Harbor of South Haven, Duck hunting guide service, steelhead fishing guide service for Southwest Michigan, trout fishing guide service for Southwest Michigan.